The Wounded Healer was another recommendation from Goodreads that was absolutely spot-on. Henri Nouwen was a Dutch Catholic priest very much concerned with issues regarding community, social justice, and psychotherapy (at least according to his Wikipedia bio). But what clearly comes out in his writing is that he cares about individuals, about ministering. As a Latter-Day Saint very much attuned to the need of ministering in love, I think Henri Nouwen is some excellent material to motivate what we need to do to change, to be better ministers. My dear friend and LGBTQ ally, Papa Ostler, recently shared some of his thoughts on The Wounded Healer after it was recommended to him by a friend. I have been increasingly concerned with how I can better help my fellow man. As an introvert who has trouble reading people and who feels stressed in social situations, I don’t feel like I’m the one for the job. But I feel a need to reach out at the pain I see all around me, a world of increasing anxiety, loneliness, depression and suicide. This past month, we had a general authority, Elder Bangerter, visit our stake. I had the chance to ask him a question to that effect: I feel a certain calling to help those who feel hurt, either by the actions of local leaders or general church policies. What principles or suggestions do you have for someone trying to help? Elder Bangerter had a few ideas, but I think the one that rang home for me, was that our love will likely do more than any attempts at explaining or clarifying doctrine. People need love. 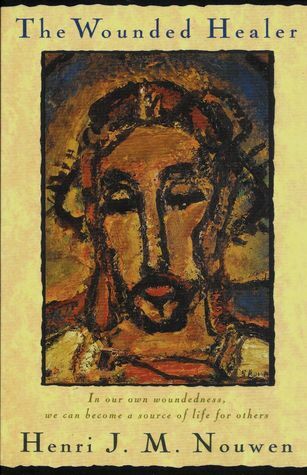 And Nouwen hits on some beautiful ideas in this book around that theme. I wanted to touch on two of my favorite points that come later in his book on The Wounded Healer. Built into the title is the image of Christ himself, who has graven us in the palms of his hands. But we, too, are to become wounded healers, if we are truly to mourn with those that mourn and comfort those that stand in need of comfort. This is the first idea I found so powerful: No one can help anyone without becoming involved, without entering with his whole person into the painful situation, without taking the risk of becoming hurt, wounded or even destroyed in the process. When we truly are ministering, we are going to be changed as a person, we are going to have to enter their pain, and there are risks associated with doing so. This has always made me fear to get close to someone who is suffering. I sometimes get stuck at a weak emotion of pity bordering on disgust: their situation feels hopeless. Can they ever change? Are they doomed to be in the same rut for their entire lives? What good can I do? I am more likely to run away from someone suffering, or give a feeble I hope you feel better soon. It is weak and superficial help. I do need to be better at this. I am afraid to help because I feel so helpless in the face of their suffering: I don’t know what I can do to help. A saint, knowing that ‘the more possessions, the more anxiety’, may be tempted to give all he has away and live in poverty. That is a noble act – but what about his wife and children? A saint may forgive all, but what if she is a judge? Shimon bar Yohai, the second-century saint, regarded it as a neglect of Torah to engage in a worldly occupation. But what if everyone acted in accordance with his teaching? The result would be destitution. Saints are noble individuals, but saintliness cannot be the ethic of a society – and Judaism is the ethic of a society. I was thinking about this same principle in the terms of ministering: if I truly seek to minister to such an extent that Nouwen describes, is there a similar danger involved? Paul Bloom brings similar critiques against empathy, instead advocating for compassion and understanding that allows us to help without literally entering another person’s pain. I mentioned in that review though, our doctrinal commitment to empathy through the atonement (taking upon them their sins and afflictions that he might know how to succor his people). I do believe there is a role in empathy, but we have to accept its risks. Nouwen does advocate for always tending to our own wounds, such that we can continue to minister to others. The next point he mentions comes as an answer to a problem common to mankind: loneliness: When our souls are restless, when we are driven by thousands of different and often conflicting stimuli, when we are always “over there” between people, ideas and the worries of this world, how can we possibly create the room and space where someone else can enter freely without feeling himself an unlawful intruder? But wanting to help isn’t enough. Expressing “I’m here for you if you need to talk” sometimes make people withdraw even more. There aren’t any easy solutions to this, but his solution is hospitality: making ourselves ready to receive our neighbor as good hosts: When we have found the anchor places for our lives in our own center, we can be free to let others enter into the space created for them and allow them to dance their own dance, sing their own song and speak their own language without fear. Then our presence is no longer threatening and demanding but inviting and liberating. This reminded me of a scene from Healing a Fractured World where Rabbi Sacks uses the example of Abraham and Sarah: What used to happen was this: whenever a stranger appeared in the synagogue, they would go up to them and greet them, give them a prayer book and invite them to sit next to them. At the end of the service they would invite them back for lunch. Their home, I discovered, was an open house. Every Shabbat their table would be full of strangers. More arrived during the course of the afternoon. Other members of the synagogue would drop in. Newcomers would find themselves, in the course of a single day, integrated into the community. They turned strangers into friends. They were the congregation’s Abraham and Sarah, watching out for passers-by, as did their biblical precursors, so that they could invite them to eat and rest awhile. They were redeemers of loneliness. I suppose I need to do what I can to prepare myself, and then take the first step of reaching out when I see someone in need.